Pack/Size: 24/6.9 oz. and 12/6.9 oz. 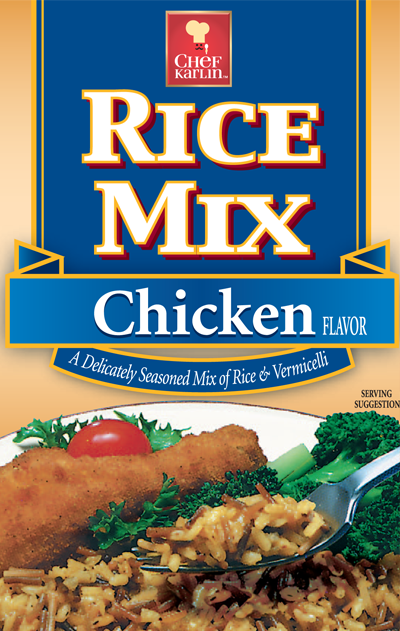 Ingredients: Enriched Rice (Rice, Iron [Ferric Orthophosphate], Niacin, Thiamine Mononitrate, Folic Acid), Enriched Vermicelli (Flour, Niacin, Iron [Ferrous Sulfate], Thiamine Mononitrate, Riboflavin, Folic Acid), Salt, Maltodextrin (from corn), Sugar, Rendered Chicken Fat, Dextrose, Monosodium Glutamate, Corn Starch, Partially Hydrogenated Soybean and Cottonseed Oil, Parsley*, Garlic*, Onion*, Soy Lecithin, Hydrolyzed Soy Protein, Natural Flavor, Caramel (color), Oleoresin Turmeric, Turmeric, Disodium Inosinate and Disodium Guanylate. In a large skillet, combine the rice and vermicelli mix with 2 tablespoons margarine or butter. Sauté over medium heat until vermicelli is golden brown, stirring frequently. Slowly stir in 2½ -cups water and contents of seasoning packet. Bring to a boil. Cover; reduce heat to low and simmer 15 to 20 minutes or until rice is tender. In a round 2-quart microwaveable glass casserole dish, combine the rice and vermicelli mix with 2 tablespoons margarine or butter. Microwave on HIGH 1 minute. Stir. Microwave an additional 1 to 2 minutes or until vermicelli is light brown. Remove casserole from microwave and allow it to cool for 1 minute. Slowly add 3-cups water and contents of seasoning packet. Microwave, un-covered, on HIGH 17 to 20 minutes or until rice is tender.